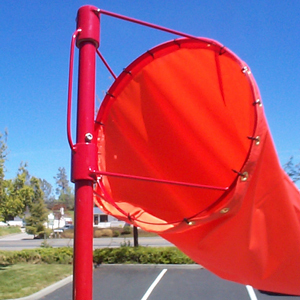 The 200-2620 Wind Sock is a cloth cone open at both ends and used to indicate wind direction. It can also be used to estimate wind speed by its angle. The most common application of wind socks is wind indication at small airports. Photo shows the 200-2620 Wind Sock and the 200-26201 Ball Bearing Frame. Our wind socks are manufactured in the USA of international orange nylon for high visibility, and are urethane coated for superior fade resistance and color retention. The hems and seams are double-stitched for strength. The standard wind sock is 8 feet long, with a throat diameter of 18 inches. The sock laces onto either the 200-26201 Ball Bearing Frame or the 200-26202 Hoop and Bail Frame, which supports the throat. The 200-26201 frame includes a short length of threaded pipe for attaching to a supporting pole using a 3/4" pipe coupler (coupler is not included). The 200-26202 includes a 3/4" pipe coupler.